The Stickmen are headlining our dance big top, Saturday night! This iconic DJ & drummer duo combine live sets with mixes bringing the tunes, the energy and the impact to Camper Calling. Expect festival grade anthems, exclusive productions and remixes of your favourite bangers - get ready to party! The Voice UK sensations and runner ups on the show, Into The Ark will be headlining the Freshly Squeezed Stage at this year’s Camper Calling. Hot from supporting the legendary Tom Jones on tour, they’ll be heading to Ragley Hall to wow us with their incredible vocals, catchy tunes and irresistible indie vibes. Sounds like summer to us! Musician and vocalist Ralph Taylor was born and raised in Suffolk, where he first fused his blend of alternative pop with a loop pedal. Ralph now plays with his talented 4-piece-band, adding yet more edge to this already dynamic performer. Attracted to every genre, he’s blended his sound into a distinctive layered style. One for the summer playlist, it’s perfect Camper Calling listening! No stranger to the festival scene, Lauran Hibberd has graced the stage at Bestival, Blue Dot, Isle of Wight, supported the likes of Clean Cut Kid and has recently sold out her first headline show. Grungy with a sprinkling of indie and smart, razor sharp lyrics, Lauran’s sound is one to keep you wanting more. The genre-defying singer, songwriter and producer FullMarx is a modern viral sensation. After paying his dues in the pubs and clubs of the country, Fullmarx had major exposure with a viral hit and was personally invited by Lucy Spraggan to join her on tour. Clever, cheeky lyrics are sure to spin in your head all weekend long. Tom first picked up a guitar late in his teens where a few modest attempts at bedroom songwriting, evolved into something he hadn’t set out to do. He’s turned a fair few heads since then, sharing the stage with Old Sea Brigade, Billie Marten and being picked out as a favourite by BBC Radio 2’s Jo Whiley. We know you’re going to love him! 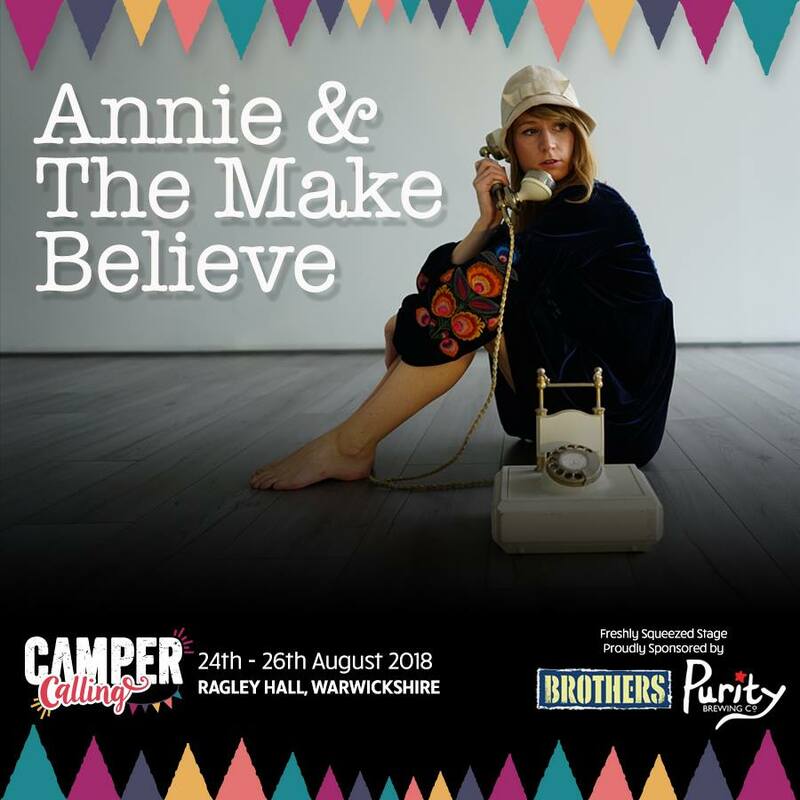 Annie & The Make Believe are a London based folk/pop band playing sweet, heartfelt music that will have you tapping your feet. Perfectly chilled for an afternoon at Camper Calling, their irresistible melodies are sure to have you adding them to your favourite playlist! We are looking for 8 teams of 6 to take part in our first ever Camper Calling Boat Race! If you are a close knit team of family or friends and fancy a challenge then this is your chance to shine! Smooth by name and smooth by nature, this band serves up fresh dreamy summer vibes. Their music draw influences from the band’s Latin roots, mixing with disco, synth pop and soulful melodies. The perfect summer mix.